The leatherback sea turtle, which can grow as long as 9 feet (2.7 meters) and 6 feet wide (1.8 meters), has inhabited this world for over 100 million years. It has outlasted the dinosaurs, the ice age and a multitude of other catastrophes. But will it be able to survive man? Scientists estimate there are less than 5,000 nesting females, down from 91,000 in 1980, and that only 1 in 1,000 leatherback hatchlings survive to adult-hood. The habitat of the leatherback spans the globe from the North Atlantic near the Arctic Circle to the South Pacific around New Zealand. Due to this vastness, scientists never believed that the population was in danger of extinction. Leatherbacks will migrate hundreds of miles every year. The females have the potential of nesting up to ten times in one nesting season and returning every 3-4 years for 30 years. However, no leatherback on the Pacific coast of Costa Rica lives long enough to accomplish this feat. Most are only capable of nesting once because they are killed at sea. "Over the last 22 years their numbers have declined in excess of 95 percent," said Larry Crowder, a marine scientist at Duke University in Durham, North Carolina. The main cause of death is due to gill-nets and longline swordfish and tuna fisheries. Longline fishing is a technique used by commercial fishing vessels which lay out vertically hung baited hooks over a distance of 40-50 miles (64-97 kilometers). Calculating the number of longline fishermen, Crowder estimates that 100,000 miles of the equivalent of barbed wire fencing is hung in the ocean each night. 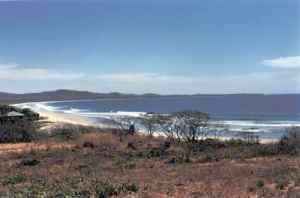 A group of scientists who have been monitoring Playa Grande in Las Baulas National Park, near Tamarindo since 1988, have tried to halt the demise of this species.